Qualification: Master of Pharmacy (M. Pharm) from a recognized University/ Institution. How to Apply: Candidates having above mentioned educational qualification may apply for the post and shortlisted candidates to appear in interview with original as well as attested copies of educational qualification, testimonials, experience certificate and other related documents. 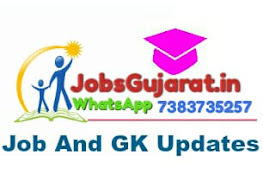 Applicant need to download and fill the application form, from the link https://nrhm.gujarat.gov.in/career-opportunity.htm and scanned copy need to be sent on email ID: vccmjobgujarat@gmail.com within 7 days of this advertisement. Candidates who apply after the due date or candidates appearing in interview without original & attested copies of documents will not be entertained.